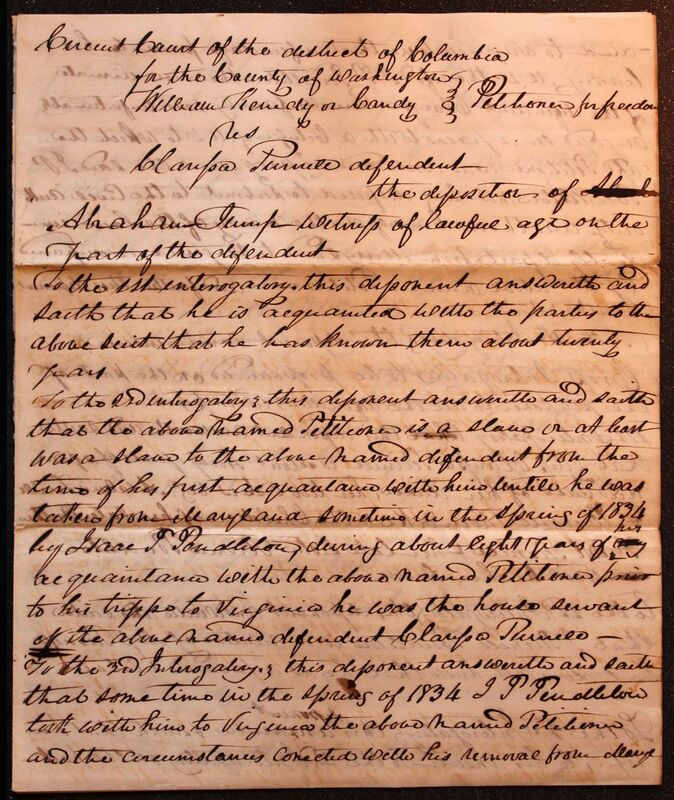 To the 2nd interogatory, this deponent answereth and saith that the above named Petitioner is a slave or at least was a slave to the above named defendant from the time of his first acquaintance with him untill he was taken from Maryland sometime in the Spring of 1834 by Isaac P Pendeleton during about eight years of my his acquaintance with the above named Petitioner prior to his trippe to Virginia he was the house servant of the above named defendant Clarissa Purnell. To the 3rd Interogatory, this deponent answereth and saith that some time in the spring of 1834 I P Pendleton took with him to Virginia the above named Petitioner and the circumstances conected with his removal from Maryland to Virginia were that a few days prior to his leaving M.D the afsd I P Pendleton then an inmate[?] 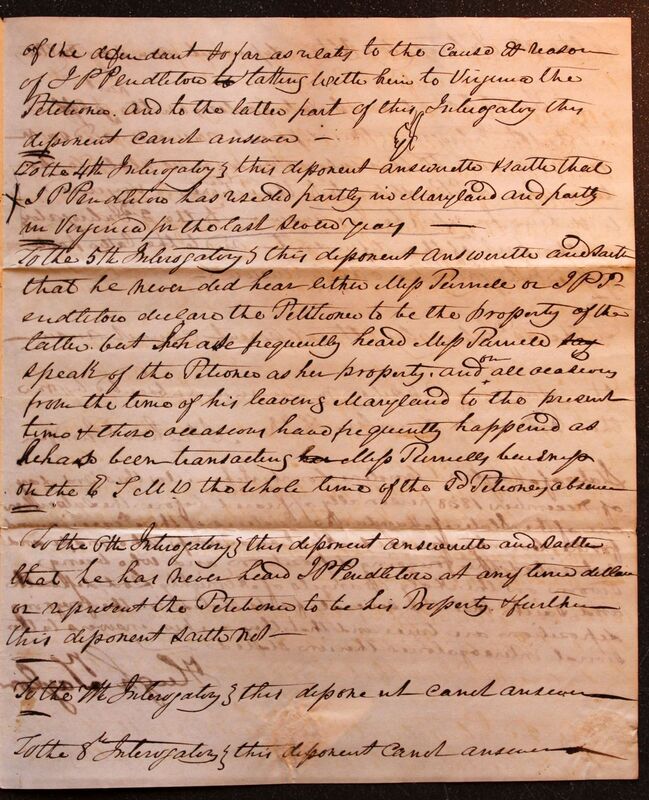 of the defendant Clarissa Purnell family was unfortunately engaged in a fracas with a [illegible] of M.D to which the add Petitioner was considered [illegible] and the said I P Pendleton not being disposed to submit to the Civil authority and throw himself on the mercy of the law immediately departed from Maryland to Virginia accompanied by the above named Petitioner. And further this deponent saith not. To the 2nd Interogatory, this deponent answereth and saith that I Purnell Pendleton is a relation of Miss Purnell but does not know that he is a favoured relative. 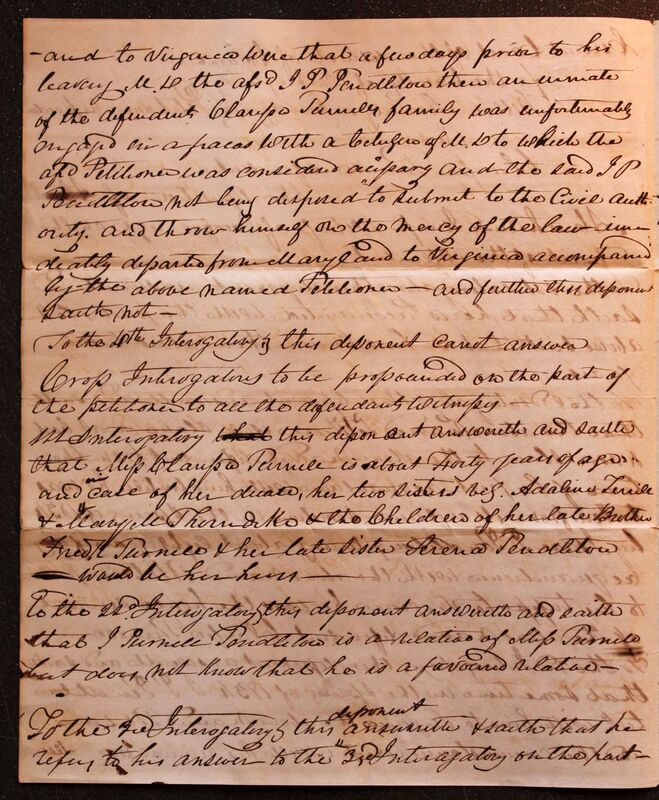 To the 3rd Interogatory, this deponent answereth & saith that he refers to his answer to the 3rd Interagatory on the part of the defendant so far as relates to the cause & reason of I P Pendleton to taking with him to Virginia the Petitioner. And to the latter part of this Interogatory this deponent canot answer. To the 4th Interogatory, this deponent answereth & saith that I P Pendleton has resided partly in Maryland and partly in Virginia for the last seven years. 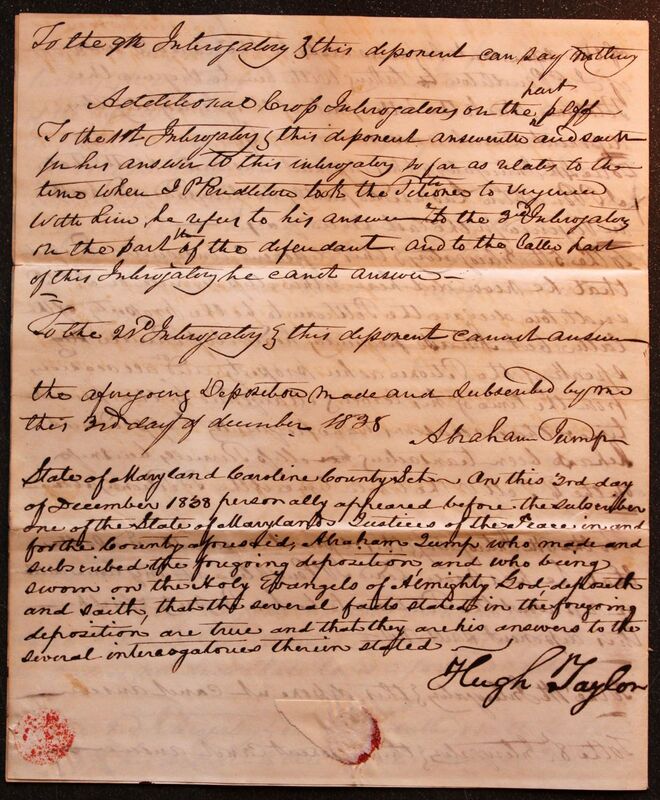 To the 1st Interogatory, this deponent answereth and saith for his answer to this interogatory so far as relates to the times when I P Pendleton took the Petioner to Virginia with him he refers to his answer to the 3rd Interogatory on the part of the defendant. And to the latter part of this Interogatory he canot answer. State of Maryland Caroline County Sct. 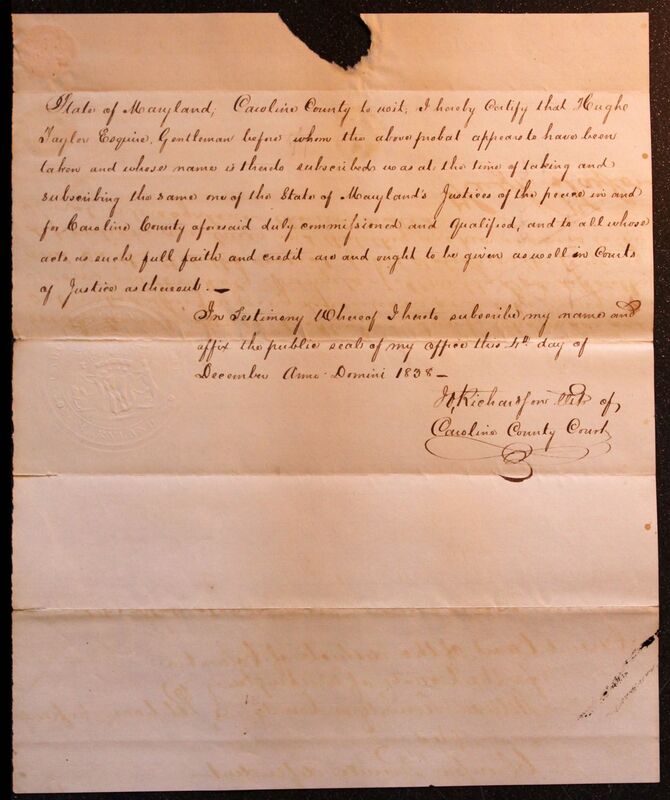 On this 3rd day of December 1838 personally appeared before the subscriber one of the State of Maryland Justices of the Peace in and for the County aforesaid, Abraham Jump who made and subscribed the foregoing deposition, and who being sworn on the Holy Evangels of Almighty God, deposeth and saith, that the several facts stated in the foregoing deposition are true and that they are his answers to the several interrogatories therein stated. State of Maryland; Caroline County to wit; I hereby certify that Hugh Taylor Esquire, Gentleman before whom the above probat appears to have been taken and whose name is thereto subscribed was at the time of taking and subscribing the same one of the State of Maryland's Justices of the peace in and for Caroline County aforesaid duly commissioned and qualified, and to all whose acts as such full faith and credit are and ought to be given as well in Courts of Justice as thereout. 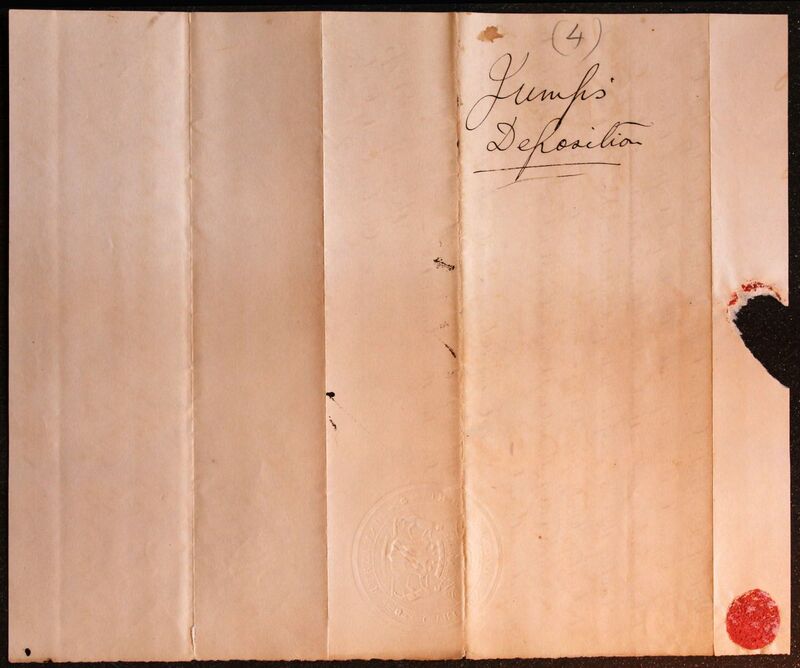 In Testimony Whereof I hereto subscribe my name and affix the public seal of my office this 4th day of December Anno Domini 1838.